For most of us it would seem that retail security guards spend much of their time standing around looking bored. Most retail store managers will tell you, however, that successful guarding in any retail sector, is much more than involved than having a person stand in a particular position. Retail security is a specialist discipline and as a result not all security companies will be able to provide the right type of person for the role, leading to disappointment and a high turnover of security guards until the right person is found. Most of these issues could have been resolved simply by the security company asking for a detailed brief of the duties that the retail company wants the guard to undertake, and by discussing their policy with regards to uniform. Ultimately it is the responsibility of the security company to provide a bespoke guarding service for their client which achieves what they have asked for without having a negative effect on staff productivity and customers. There are several ways of ensuring the retail client is provided with the best retail guarding service and here at MA Security Guards we do our utmost to make sure that this happens. 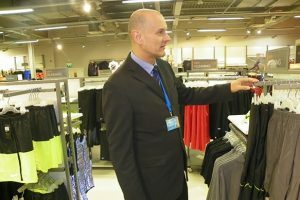 Uniform and presentation – the most appropriate uniform for the retail security guard to wear should complement the aesthetics and style of the store, provide a visible deterrent to would be offenders, and not make him appear intimidating or off-putting to customers. Depending on the store, the right kind of uniform may be a tailored suit or an official looking guard uniform. Capability and attitude – A retail security guard should be chosen by the security provider according to his suitability for this specialist role. If, for instance, the guard in question spends most of his time working as a patrol guard, visiting numerous premises and responding to alarm call outs, then he’s probably not the best choice for a retail store which is relatively less active. Also a guard who spends most of his time controlling crowds at events, may not fit that well into a long term post as a retail security guard either. Selecting a guard with the right personality makes all the difference and can avoid the scenario of a bored looking guard who is just standing around. Clearly defined brief – A clear brief of necessary duties helps to keep the guard focused and mentally alert provided the given tasks don’t detract from his prime role as a security guard. Such tasks could be something as helpful as counting the number of people entering the store and making a note of times when there are no customers. Guards who have a list of duties to perform are less likely to distract members of staff who are working close by. It also helps to move guards around from one store to another, since this prevents boredom and over familiarity. The key takeway is that successful retail security guards should look the part, act as a visual deterrent to potential criminals, be polite and courteous to the public, and allow staff to focus on greeting customers and offering them assistance. If you’re in need of retail security guards then give MA Security Guards a call on 03 9339 3500. With many years experience behind us, our focus is on providing great customer service and tailored guard services, with a fresh, modern approach.